No matter what weather conditions you live with, Xpose Safety's Super Heavy Duty Poly Tarp can protect your goods. Waterproof, rustproof and UV resistant, it keeps your precious possessions protected from water and the sun. This rip resistant, 16 mil thick tarpaulin with reinforced edges lasts longer than cheaper competitors. Enjoy exploring the great outdoors? Pack along one (or more!) of these Super Heavy Duty Poly Tarps on your next camping or hiking trip. Create a tent by pulling rope through the grommets of this tarp and securing to the ground to stay safe and dry through the night. Light a blazing flame with wood piles protected from the rain and other moisture by Xpose Safety's tarpaulin. Sitting down to enjoy a picnic? Spread this tarp on the ground to keep clothes clean and provide protection from ticks and other insects. These weatherproof tarps can also protect your canoe or sailboat. 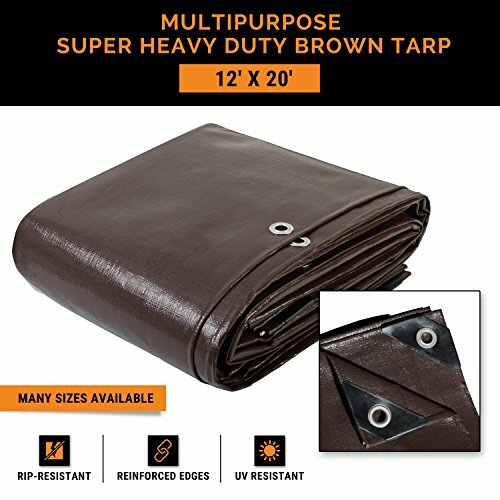 These tarp can be used indoors too! Protect products in your store from dust, or cover your floors when painting or cleaning. The uses are endless!